I've been thinking about a serious issue lately. Are there any potential plot lines still left unexplored in Barbie movies? I mean, if I were listening to an executive Barbie think tank as they sat around the conference table and conceptualized the next movie, what would that conversation sound like? Executive 1: "I'm thinking fairies.... you know, an entire world filled with fairies." Executive 2: "We did that with Fairytopia, remember? Even so, it's an idea. We might be able to modify it. Perhaps we could insert fairies into the regular human world and design an alternate fairy reality that surrounds the humans." Executive 3: "But that was our angle with A Fairy Secret." Thoughtful nods around the table. Executive 1: "Still, fairies are so versatile! Think how much they added to Barbie Princess Charm School." Executive 3: "There's no denying that." Executive 2: "Now the princess theme -- especially when the princess doesn't actually know that she's a princess -- that's an idea worth exploring more in depth. We haven't even scratched the surface there." Executive 3: "Plus, we've only managed to milk the mermaid concept for two movies. I'm sensing that avenue is more nuanced than we first imagined." Executive 2: "Especially since it integrates with the princess theme so seamlessly. Aquatic royalty! That's golden!" Executive 1: "Do you know what else is golden? Fairies. 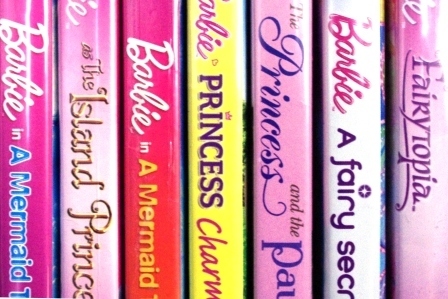 Fairies are gold for Barbie movies. Do you think it's possible to merge fairies with mermaids? Would the water compromise their ability to fly?" Executive 2: "You know, you're onto something here." Disclaimer: If Barbie Underwater Fairy Surprise Princess Adventure ever is released straight to DVD, I'm fighting for a share of the royalties. Sadly, I've seen so many Barbie movies that I recognized every one that your 'Executives' talked about. The other day my girls were discussing what movie to watch and the older one taught her sister, "Go for Mermaidia, because mom kind of likes that one. Never ask for Princess and the Pauper- we only watch that when Dad's in charge." So you don't dig that "I'm just like you, you're just like me" song from Princess and the Pauper? Out of all Barbie songs, that's the one most likely to get lodged in my head. Don't know if that's a good thing or a bad thing. How funny! Thankfully there are no Barbie movies in our house! I laughed so hard at this. You are a million percent spot on. I have seen far too many barbie/fairy/mermaid movies and my daughter is only 3. I fear for my future. Well in my house, 3 boys, I sing Chuck the truck, Handy Manny, and Dinosaur Train ;/ I've never seen Mermaid Fairytopia or whatever its called and honestly did not even know Barbie had movies!! LOL Closest I get is Doc McStuffins and boy am I glad she can take all the ouchies away!!! Why the hell do they make those songs so catchy?? Hot dog hot dog hot ugh!!! Ladies, I don't know any of you, but I too am afflicted with "Barbiemovitis" in my house of 3 girls. I was at first confused hearing about the upcoming Princess and the Pop Star because of, you know, Princess and the Pauper. And they even resurrected some of the songs (To be a princess). What is even more crazy is how much the singing Barbies go for on Ebay for the retired movies.... Ah well, at least I'm not the only one still singing "Here I am, being who I want, givin' what I got, never a doubt now"... along with the singing microphone. My mother wants to know why I am always buying new Barbies when we have 100 but every time there's a new movie we have to get at least one so the girls can play the movie plot... but the best is when they play mermaids in the bathtub and then yell "Mom, can you get me a human from the toy box?" Oh, gosh, I never even realized the similarity with Princess and the Pop Star and Princess and the Pauper! Too ironic! That song is the WORST. The absolute worst. Once it's in my head it doesn't leave. I will take The Twelve Dancing Princesses, Fairytopia, Rapunzel, and Swan Lake all before I can handle the Princess and the Pauper. Argh, Facebook and its algorithms!